Chrysanthemum will appear on the 15th of April and the 15th of October. Deadline for the spring issue is the end of February and for the fall issue at the end of August. Include your contribution in the body of the email; no attached files. 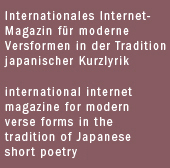 Please send up to 5 Haiku / Senryû / Tanka at a time for consideration, 2 Haiga or 1 Haibun. Collaboration Poetry will be considered only occasionly. All submissions must be unpublished and not under consideration elsewhere. If work originally published by Chrysanthemum is submitted elesewhere, please credit the magazine. All contents are copyright by the authors. All rights revert to the authors upon publication in Chrysanthemum.